Very tightly wooded, requiring precise throws. $8 parking for non-residents. $2 fee to play disc golf. Mini-golf, snack bar (w/discs), pool, boat ramp, camping, etc. From I-95 S; exit 163 to Lorton. Left on Lorton Rd. Go under 2nd overpass and to a right on Lorton Market St. (see Shoppers Food Warehouse). Go 1.5 miles to traffic light at Rte. 1. Go straight through light (becomes Gunston Rd. ), then 1.5 miles to golf course entrance on left. No need for bomber rips here, short and technical course. Hard to loose a disc, and a great course to introduce new players to. 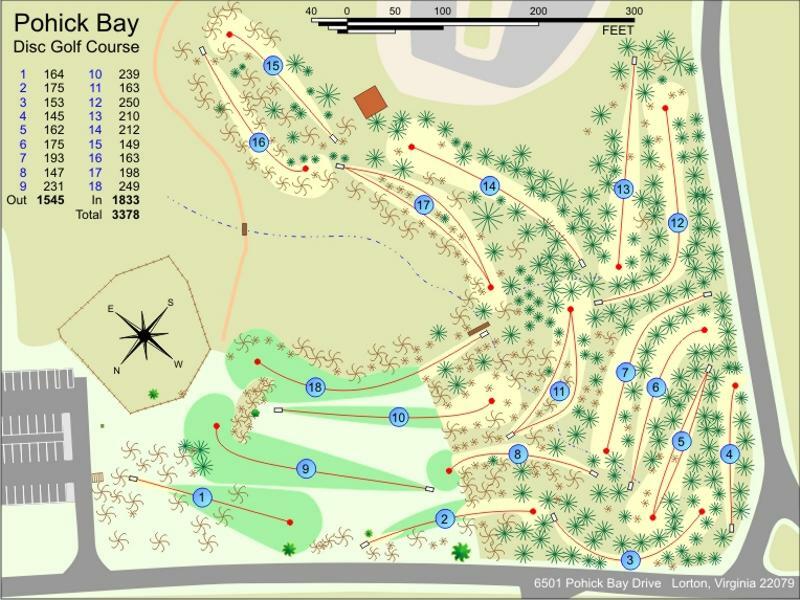 Almost all holes are in a wooded area. Keep a eye out for wildlife. Pohick is a pretty well maintained course that is very short and almost exclusively in the woods. A new set of OB markers on 17 and a new elevated tee box on 18 are nice improvements. This is a good course for beginners, but can also be a challenge for more experienced players. Short and technical. Can play two or three rounds with a partner in a hour and a half. Also, very hard to lose a disc.